My habit of watching war films for the Memorial Day holiday, partially for my entertainment but also to remember the men and women who’ve died in active military service, uninterrupted. Yet, finding the time to write about them as I have in the past, back-burnered these days. Not complaining, just stating. Over the weekend, TCM brought an adventurous smile to this movie viewer with two favorites run back-to-back. The fact they were by a great collaborative tandem, the icing on the cake. The duo we speak of being actor Clint Eastwood and the actor-turned-director, Brian G. Hutton. The dauntless pair of films they constructed a prominent double-bill for the classic movie station, featured two striking opening titles sequences. Specifically, Where Eagles Dare (1968) and Kelly’s Heroes (1970). As this series has already drawn focus on the former awhile back, let’s spotlight the latter on what had been the traditional date to celebrate this day, which ended in 1970, ironically. The exact same font, telltale – curly, blood-red type used by each war film to begin their opening. Undoubtedly, intended to infer “German” to viewers, and which side of the battle line each situated. Behind the enemy’s and under the cover of darkness, the graphic hint, here. Whether MGM attempted to save money by re-using what had worked before with Where Eagle Dare, pure conjecture on my part. We’ll never know as neither listed who furnished the movie card art in their credits. Still, the rain-swept opening scene, one that threw the onlooker in the midst of a formidable German mechanized battalion prepping for action, thunders an introduction like few other American war films. A German Feldwebel (sergeant) spurring and ushering men and equipment into place for what’s to come certainly unexpected as DP Gabriel Figueroa‘s camera meanders through the Wehrmacht’s preamble. So, too, the American jeep casually idling amongst the Kübelwagen and field pieces. Our man Clint, about to bring the captured Colonel sitting next to him in the front seat, back to his side of the line, another barometer this wasn’t going to be the standard war film of decades past…not by a long shot. Also known as a Willys MB, Ford GPW, or G503, and formally called the U.S. Army Truck, 1/4 ton, 4×4, Command Reconnaissance, but commonly as Jeep or jeep. The audience left to piece together how they got there, let alone found and captured an intelligence officer at gunpoint, when the man rousting his German army cohorts awake finally takes notice. Thus, starts one of the more audacious escapes put on film as the opening credits continue to blink past the audience and surprised German soldiers now realizing it. All as the opening American artillery salvos begin to rain and range in those on this side of post-D-Day France. And as our hero stomped the vehicle’s accelerator, launching his way back and upping Kelly’s Heroes tempo a notch, Lalo Schifrin‘s wonderful music also took charge. Once more, it’s a surprising and unanticipated theme song for a film made during the contentious time of America’s involvement in Viet Nam2. 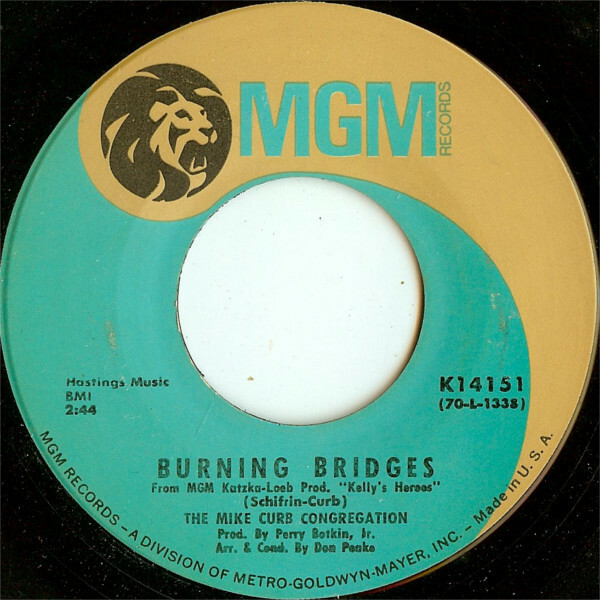 Written and orchestrated by the renowned composer-arranger-conductor and Mike Curb3, the lament-filled lyrics of Burning Bridges offered a more than interesting contrast. The same year The Lads broke-up and a number of drug-related deaths of ’60s performers4, among the tidal changes in pop music, normally wouldn’t have portended well for an act like The Mike Curb Congregation. Their group harmonies, family friendly AM radio songs seemed limiting, even then. Yet, they’d survive the decade care of this haunting theme turned modest hit5, earning backing work for other acts. The song stood out even though it bears no real relation to a war-turned-heist film. Although, given the film’s end result, maybe it could be the intrepid Kelly’s requiem somewhere down the line. I love that red-tailed font. How symbolic. One could not use it today. It instantly connects to Nazis. My Memorial Day TCM was “The Great Escape”. Very nice piece of work and favorite film tunes, Michael. Always felt that “Heroes” was aimed more at Vietnam (Like Altman’s M*A*S*S*) than WWII or the Korean War. Since Mr. Siegel also directed another of my favorite WWII films, ‘Hell Is For Heroes’ with Steve McQueen and a “Murderer’s Row” of classic Character Actors in the wigs. I wonder how this film would have evolved or been remembered under his direction? Good point, Kevin. Siegel’s take with this would no doubt have been different, and maybe, just maybe, MGM wouldn’t have re-cut the film as they did with Hutton’s. Something Clint has stated he was disappointed with re: Kelly’s Heroes. Many thanks, my friend. It’s certainly an impressive opening and I like the song. It feels kind of 60s but also a soldier’s lament song. It kind of matches for me.